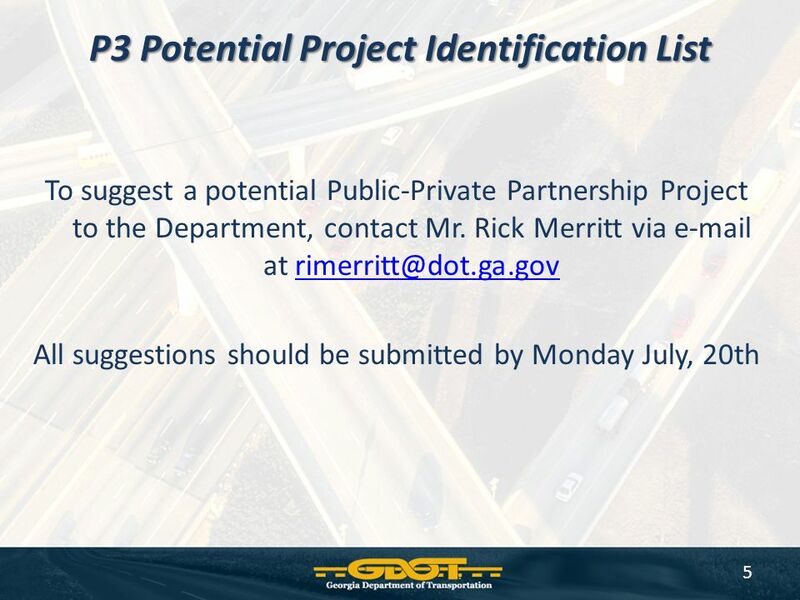 GDOT PowerPoint Title Page P3 Potential Project Identification. 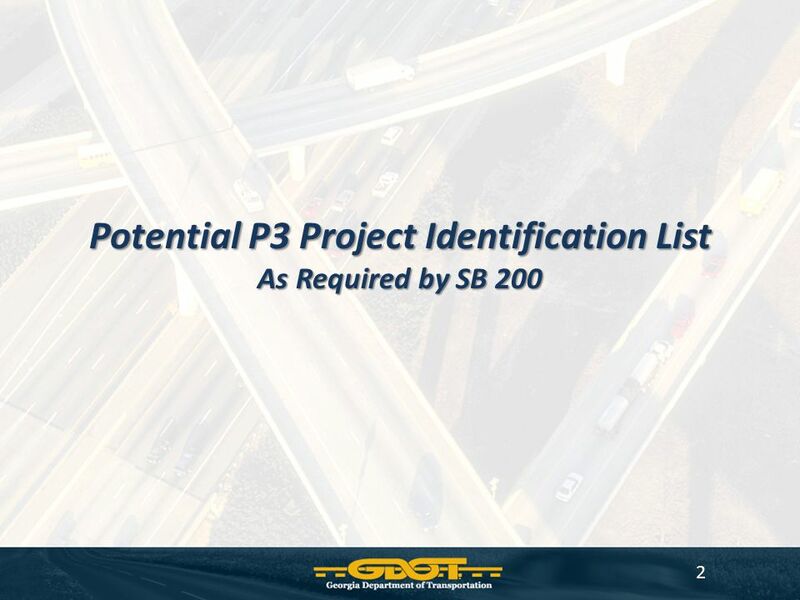 3 3 P3 Potential Project Identification List According to SB 200 The Department will identify and report to the board by July 31 of each odd numbered year projects on the State- wide Transportation Improvement Program (STIP) or otherwise identified in providing gains in congestion mitigation or promotion of economic development o If the project is in the STIP and will not be initiated two years after the reporting date or that does not have specific available funding, the project may be let utilizing the procedures of the P3 Code section o The department will work in conjunction with Governor's appointed GDOT Planning Director Todd Long, on the potential Public-Private Partnership project list for coordination in the STIP. 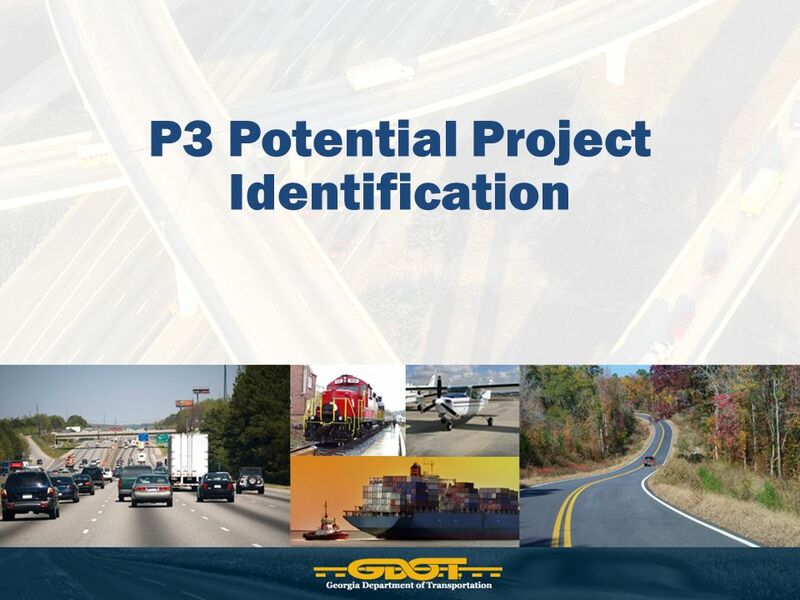 Download ppt "GDOT PowerPoint Title Page P3 Potential Project Identification." ASTM International and PlaceWare Web Conferencing Virtual Meetings Overview. Monterey Peninsula Water Management District MPWMD Annual Report March 21, 2005 U:\rick\powerpoint\staffnotes\2005\032105\annualreport. Recommended Guide for Next Generation of Transportation Design-Build Procurement and Contracting in the State of Georgia Russell McMurry, P.E. Chief Engineer. State of Connecticut Department of Transportation PUBLIC LISTENING SESSION Planning for Connecticuts TransportationFuture September 2003 Beyond Ten… A. OFFICE OF GRANT PROCUREMENT, COORDINATION & MANAGEMENT Department of Administration 3/8/2012 Nevada Office of Grant Procurement, Coordination & Management. Transportation Planning for Washington State’s Aging Population. ROADS PAVEMENT FORUM ROODE VALLEI COUNTRY LODGE PRETORIA 13 November 2001 TECHNOLOGY TRANSFER CENTRES Kenny Kistan. 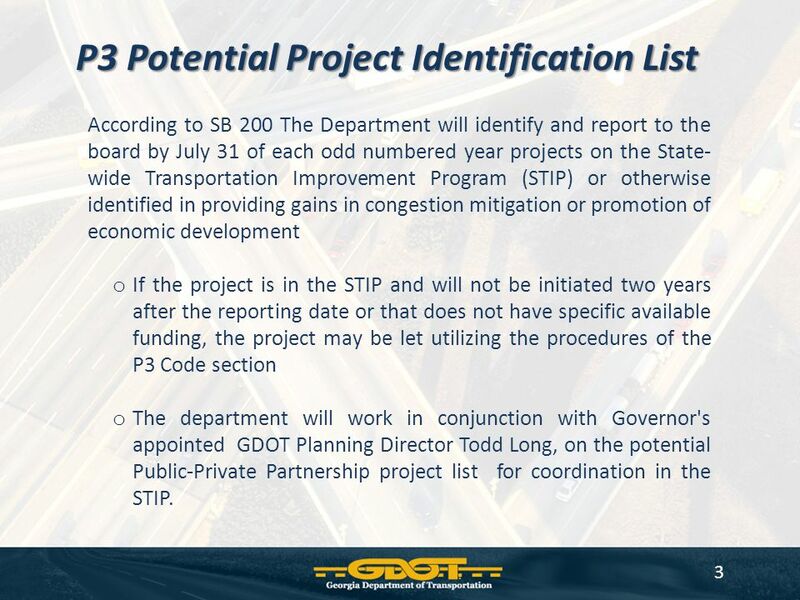 VTrans2035 Update March 30, Dironna Belton Office of Intermodal Planning and Investment. California Department of Aging State Contractors and Nationals Meeting January 13, 2010. 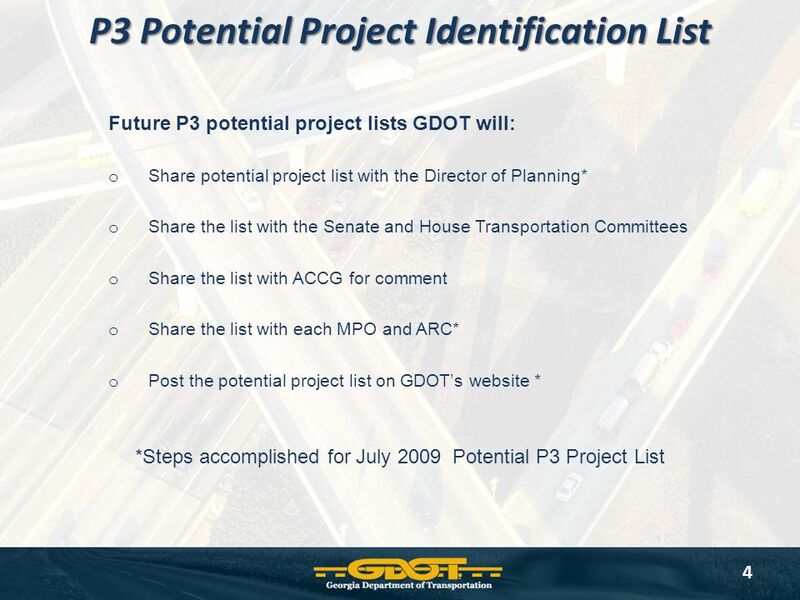 1 Item #8 Dismissed Complaint Against TPB in the Inter-County Connector (ICC) Lawsuit Presentation to the Transportation Planning Board Ronald F. Kirby. Pupil Accommodation Reviews 2011 An Overview Of The Process. Senate Bill 200 (revised July 10, 2009) 1. 2 Timeline Overview 2/19/092/20/093/27/094/3/095/11/096/18/09 Governor announced Transforming Transportation. Warren County Schools Academically and Intellectually Gifted (AIG) Plan AIG Plan Presented to the Warren County Board of Education June 11, 2013. 1 Parent involvement is most successful when it is viewed, practice and promoted as a partnership between the home and the school. Resource: California. U.S. Department of Transportation Federal Transit Administration GAMPO: FTA Update July 29, 2011 Robert Buckley, Community Planner Parris Orr, Community. Public Participation Advisory Committee February 25, 2015. Rail Freight Assistance Program (RFAP) S ETTING THE S TAGE FOR THE F UTURE Rail Transportation Assistance Program (Rail TAP) RFAC Meeting April 28, 2010. Behavioral Health Board Chapter 31, Title 39 Idaho Code.